Timber bollard pinch points at the start of the track at the carpark. The gap between the bollards are 1.18m, they are 55cm high. Culvert under path with exposed drainage ditch on the very edge of path. A drop of about 25cm. 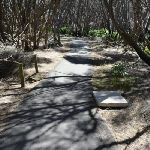 Marked with timber bollards, there are a series of 4 more similar drainage ditches about every 40m. A timber bench seat, 55cm high, 22cm deep and 2.4m wide with no backrest. The seat is 1.7m off the side of the path. A timber bench seat, 58cm high, 22cm deep and 2.4m wide with no backrest. 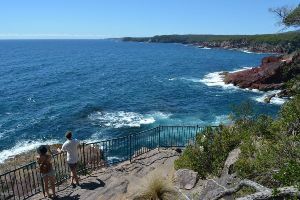 with pleasant coastline view. From here the path starts to lead gently uphill for 50m to come to a clear 3-way intersection (with a timber path and Boyd Tower on the left). 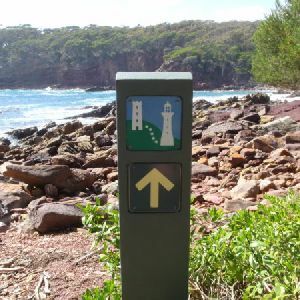 Continue straight: From the intersection, this walk follows the asphalt footpath towards the sea, keeping the tower a short distance to the left. 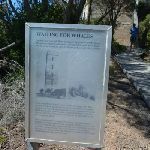 The path leads over a small rise then in about 20m leads down a very steep and narrow set of steps to the fenced Red Point Lookout and ‘Stony History’ information sign. At the end of this side trip, retrace your steps back to the main walk then Turn right. 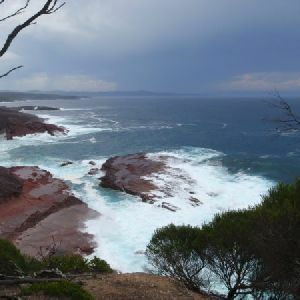 Red Point Lookout is in Ben Boyd National park and is accessed by a clear but very steep set of steps from Boyd Tower. The lookout is fenced and has a sign explaining a bit about the local geology. The lookout provides a great view south, down the coast of the park. 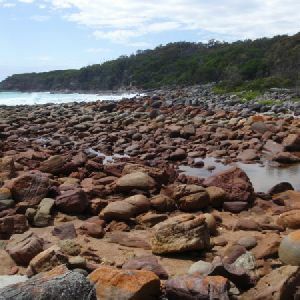 A great example of folded rocks is clearly visible where the sandstone and metamorphosed red siltstone were compressed and bent to form distinct arches. Turn left: From the intersection, this walk follows the timber board walk gently up to come to the front entrance of Boyd Tower. Boyds Tower was commissioned by Benjamin Boyd and originally designed to be a lighthouse. 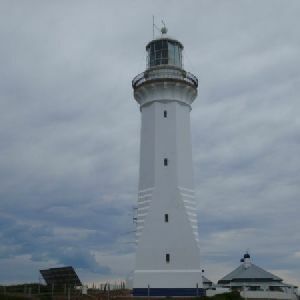 After the Government rejected the proposal of the private lighthouse, Boyd changed tact and built the Sydney sandstone tower for whale spotting. 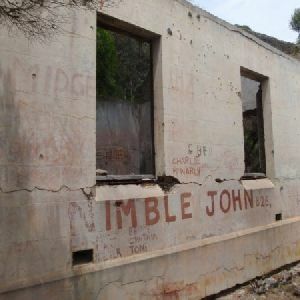 The tower gave his whaling ships a strong advantage over other whalers in the area. 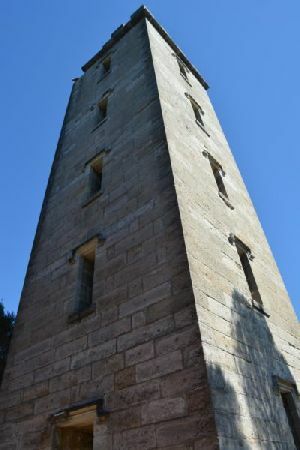 Built in 1847, Boyds Tower is a large sandstone tower on the southern head of Twofold Bay in Ben Boyd National Park. 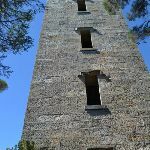 The top of the tower bears the BOYD title, and boast several viewing points. 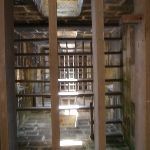 The ground floor of the tower is open to the public and is well worth exploring. 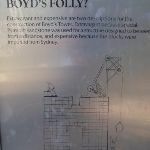 Boyd was declared bankrupt soon after completing the tower and left Australia for the Californian goldfields. Boyd died in the Solomon Islands in 1851 whilst hunting game. 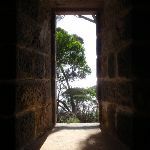 “Ben Boyd’s Tower is watching – Watching o’er the sea Ben Boyd’s Tower is waiting For her and me.” Henry Lawson (1910) The bottom floor of the tower is open to the public via a 1.2m wide sandstone door frame. A timber bench seat, 50cm high, 43cm deep and 2.1m wide with no backrest. 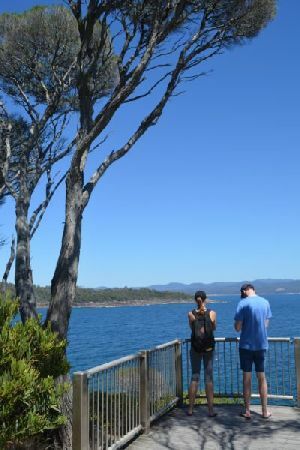 then the fenced Twofold Bay lookout platform. At the end of this side trip, retrace your steps back to the main walk then Turn right. 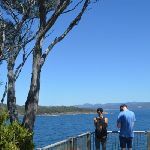 near the lookout to rest and enjoy the view. 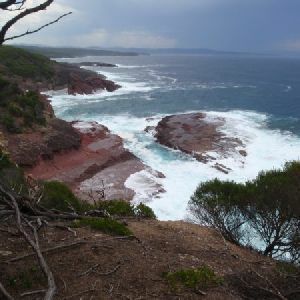 The view looks north-west across the bay to Eden, Boyd Town and Edrom to the left, and out over the South Pacific Ocean on the right. Seats: There are 2 places to sit on this walk. They are 230m apart. Trip Hazard Culvert under path with exposed drainage ditch on the very edge of path. A drop of about 25cm. Marked with timber bollards, there are a series of 4 more similar drainage ditches about every 40m. Found about 90m into the walk. This whole walk, 290m is flat with no steps. 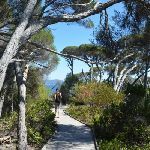 This whole walk, 290m follows a smooth and hardened path. This whole walk, 290m is clearly signposted. 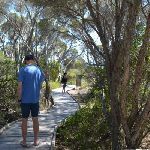 This whole walk, 290m requires no previous bushwalking experience. This whole walk, 290m is not usually affected by severe weather events (that would unexpectedly impact safety and navigation). 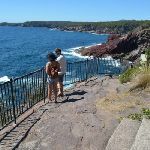 This whole walk, 290m is close to useful facilities (such as fenced cliffs and seats). 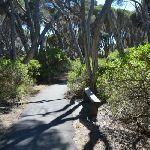 A list of walks that share part of the track with the Boyd Tower walk. 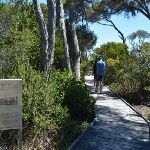 This walk is a fantastic way to see some of Ben Boyd National Park’s heritage and spectacular coastline. 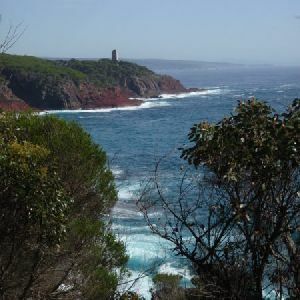 The walk passes the iconic sandstone Boyd Tower and continues on to the wide views from the lookout over Twofold Bay. 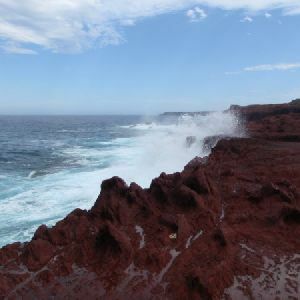 The side trip to Red Point lookout is well worth it to see the dramatic rock folds that are found along the coast of the national park. 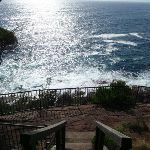 Note that the side trip has as very steep set of steps. 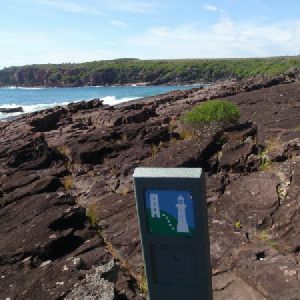 Starting near Boyd Tower, this walk follows the Light to Light walk to a bay with a fine red gravel beach. 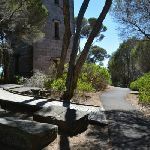 The walk passes scenic views of Boyd Tower, through the scrub, as it continues past awesome examples of geological rock folding in the cliffs of the bays. Red Sands bay itself is something quite different with its large grain red sand/gravel mixed with smooth round white pebbles and other rocks. The contrast in colours with the ocean and a blue sky is quite something. 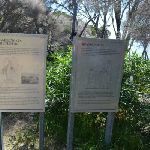 A list of walks that start near the Boyd Tower walk. Leather Jacket Bay is a rocky and wonderful bay. 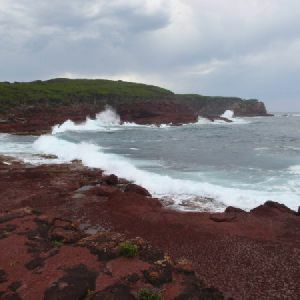 The walk through Ben Boyd National Park starts at Boyd Tower car park and passes through Red Sands bay with its stunning contrast of colour. 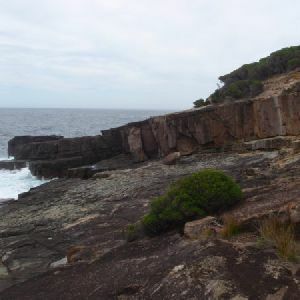 The walk not only passes some beautiful coast line to Leather Jacket Bay but some superb examples of geological processes with rock folding and banding. 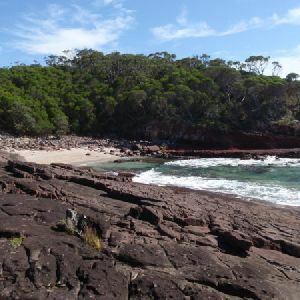 There is a small clearing at Leather Jacket bay with some shade, making it a nice place for lunch before heading back. 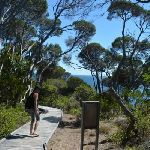 This short walk takes you straight down to Long Beach, which is a popular fishing spot. 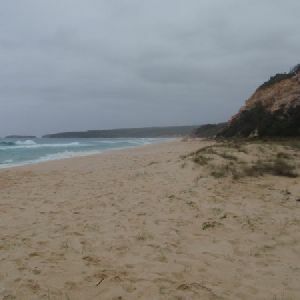 The beach itself is a large expanse of sand with strong surf conditions. 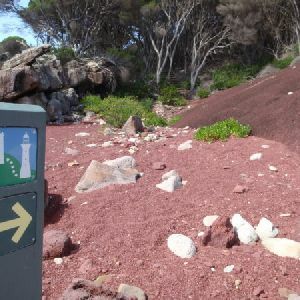 The walk provides direct access to this great beach and heads through a pass, down through a steep gully with red and white rock walls. 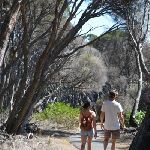 The Pinnacles are an amazing brightly coloured rock feature, and the centre piece of this walk. 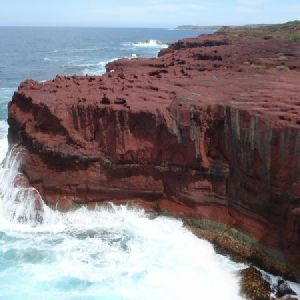 The reds and white of the rock contrasts with the green heath and blue sea creating a fantastic sight. The smaller lookout, one without a sign, is a better lookout than the larger area. 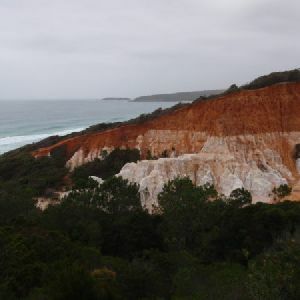 However, both lookouts give a good view of the Pinnacles. 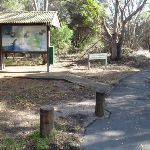 http://new.wildwalks.com/wildwalks_custom/includes/walk_fire_danger.php?walkid=nsw-benbobnp-bt Each park may have its own fire ban, this rating is only valid for today and is based on information from the RFS Please check the RFS Website for more information.